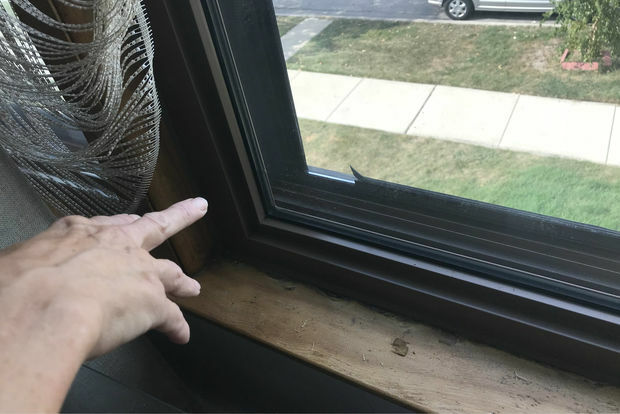 Midway resident Pam Zidarich points at a noise-cancelling window in a neighbor's home that is melting in the heat. CITY HALL — Angry aldermen told Aviation Commissioner Ginger Evans that she had not done enough to investigate complaints that city-installed, noise-cancelling windows installed near Midway and O'Hare airports are giving off a noxious, worrisome odor. Evans told aldermen that officials have confirmed that windows in 149 homes are emitting an unpleasant odor that some worry is causing health issues. The city installed 20,000 noise-reducing windows starting in 2005 in an effort to soundproof homes from overheard jet noise. That is a 62 percent increase in the number of confirmed cases of smelly windows since city officials held a hearing earlier this month near Midway Airport. Evans has promised aldermen that all windows emitting the odor that are under warranty will be replaced. The warranties on the windows in 50 of those homes have expired, Evans said. Aldermen have urged the city to replace the windows regardless of the status of the warranty, but Evans has declined to commit to that. In all, the city has inspected 220 homes, Evans told aldermen. Midway residents have complained of an overpowering smell that envelopes their home when the windows are in direct sunlight. The odor has been described as smelling like an electrical fire. "It takes your breath away," one resident said at a hearing on the issue. "It's a worrisome smell." The city has hired an outside firm to test windows in nine homes where the odor has been detected at a cost of $150,000, Evans said. Ald. Marty Quinn (13th) said Evans promised at the earlier hearing — when there were 92 confirmed smelly windows — to test "10 percent of all confirmed cases" for nearly three dozen chemicals. Evans said the city's consultant had told officials testing nine homes would be sufficient for the first round of testing, even though Quinn said 10 percent of the confirmed cases would now be 15 homes. "Don't try to spin this, commissioner," Quinn said. "This is spin and my patience is growing short." Ald. Ray Lopez (15th) said he was not getting the answers he needed about the issue — and said Evans had responded to the complaints with "too little effort" and "too many words." "I'm disappointed by this department's lack of empathy," Lopez said, suggesting that Evans did not deserve her $100,000 bonus, even though her contract pegs that to a host of unrelated issues. In addition, several aldermen renewed their complaints about Evans' decision to strip aviation security officers of their police powers, saying it jeopardizes the safety of passengers at O'Hare and Midway airports. Evans was also criticized by several aldermen by not hiring more black and Latino employees or awarding more contracts to black and Latino-owned firms. Aldermen aired similar concerns at last year's budget hearing.